Unlike steam, which once outside the boiler has one basic quality, pressure; compressed air powering your equipment, has many important qualities. Pay attention to these qualities and you’ll be rewarded with smooth trouble-free operation of both the air compressor and the productive machinery being powered by the compressed air. Ignore them and you’ll be open to lost production time, higher utility costs, and more frequent repair costs. BEFORE ATTEMPTING ANY MAINTENANCE TO YOUR AIR COMPRESSOR OR COMPRESSED AIR SYSTEM BE SURE THE ELECTRIC POWER IS OFF, NO SAFETY DEVICES HAVE BEEN DEFEATED, AND THERE IS NO AIR PRESSURE LEFT IN THE COMPRESSED AIR SYSTEM! ELECTRIC MOTOR- Provides the torque required to operate the pump. There are two types of motors, a single-phase motor and a three-phase motor. Single-phase motors are typically used in compressors that require lower levels of horsepower (typically 7.5 HP or less), or when three-phase power is unavailable. These motors are generally capacitor start/capacitor run and are easily identified by the protrusions on top of the motor containing the capacitors. Fortunately, most compressor motors do not require maintenance unless there are grease fittings on the end bearings (these fittings are generally found on larger motors in excess of 7.5 HP). PUMP- The heart of the compressor which converts the rotational energy of the electric motor into the potential energy of pressurized air. 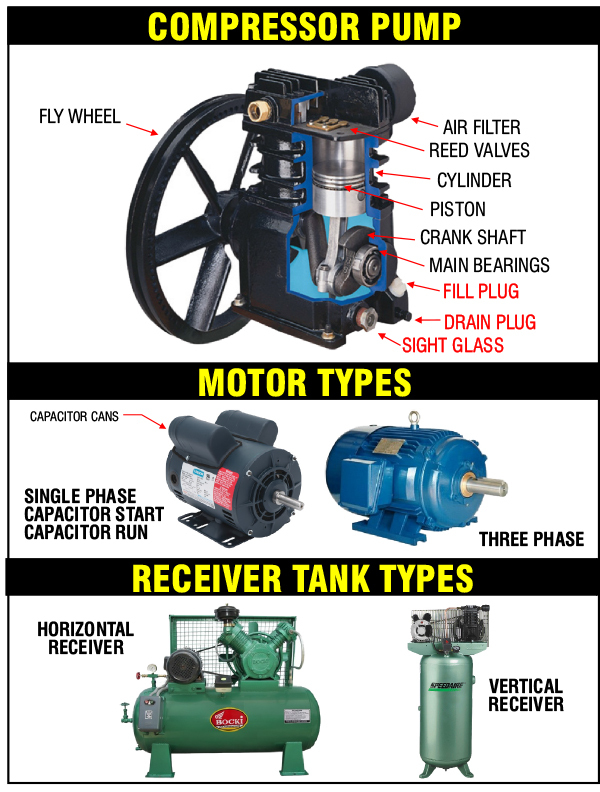 There are several families of compressor pumps. However, for our purposes we’ll discuss only the reciprocating type. This family of compressors is the most common in our industry. They use pistons moving inside cylinders working with associated valves to compress the air. In an air compressor the electric motor provides rotary force linked to a fly-wheel (usually via belts) which rotates a crankshaft. The crankshaft translates this rotary motion into reciprocating or up and down motion, sliding a piston inside a cylinder. At the top of the cylinder there is a set of reed valves, an intake and an exhaust. On the piston downstroke the intake valve opens allowing air to be sucked into the cylinder while the exhaust valve shuts, isolating the pump cylinder from the stored compressed air in the receiver. On the upstroke of the piston the intake valve shuts and exhaust valve opens. This isolates the cylinder from the air supply enabling the rising piston to compress the air in front of the piston head while also providing an exit path from the cylinder into the receiver (tank). All of the moving parts in this portion of the compressor along with seals and gaskets require lubrication. In order to minimize friction and wear, all this linear and rotary motion must take place in a bath of oil. Not just any oil, but an oil engineered for the type of lubrication service required for air compressors (DO NOT USE MOTOR OIL IN AN AIR COMPRESSOR). Keep in mind that not only must the oil be designed to be compatible with the rubber, plastic, and metal parts in the compressor it must not degrade components in the machinery that will be using the compressed air. Oil levels contained in compressors should be checked weekly; there’s generally a small round sight glass toward the bottom of the compressor pump and with the compressor off a level of about ½ way up the height of the sight glass should be visible. Add oil if its’s low in the sight glass or not visible. The oil itself should be drained and disposed of properly then replaced at least once annually. Fill and drain plugs are usually located near the sight glass. A second maintenance point is the belts coupling the electric motor to the compressor pump. They are subject to wear and need to be monitored at least monthly. You’ll know when they begin to fail because you’ll hear them squeal when the compressor starts. Do not use “belt dressing” to avoid adjusting or replacing failing belts. When the belts are properly adjusted pressing your thumb against the outside surface of the belt about ½ way between the motor pulley and fly wheel should result in about a ½ inch deep arc on the belt. When adjusting belt tension do not overtighten the belts, this causes premature belt wear and bearing failure. Look carefully at your belts. If there are loose threads, separations between layers of rubber, or cracks across the face of the belt don’t wait, replace them. Belts should always be replaced in sets with the same specifications as the originals. RECIEVER- Also called a tank, stores the compressed air serving as a reservoir to take care of sudden demands in excess of compressor capacity. Additionally, it damps pulsations from the discharge line of the compressor resulting in essentially steady pressure in the system. It also prevents too frequent starting and stopping of the compressor. In addition, it condenses and contains some of the moisture and oil carryover that is present in the compressed air as it exits the pump. It’s necessary to drain the accumulated water and oil from the receiver on a regular basis. This is normally accomplished by opening a drain valve located at the bottom of the receiver while the receiver is pressurized. Pressurized air blows the water and oil out the bottom of the receiver. Bruce Grossman is the Chief of R&D for EZtimers Manufacturing. EZtimers is the manufacturer of the new EZ Level return tank water level control. To prevent boiler scaling and other damage the EZ Level return tank water level control replaces that troublesome ball float valve in the condensate return tank. For saving money on handling waste the SAHARA and DROP IN THE BUCKET line of high purity separator water mister/evaporators provide a thrifty, legal method to get rid of the separator water generated by your dry-cleaning machine. 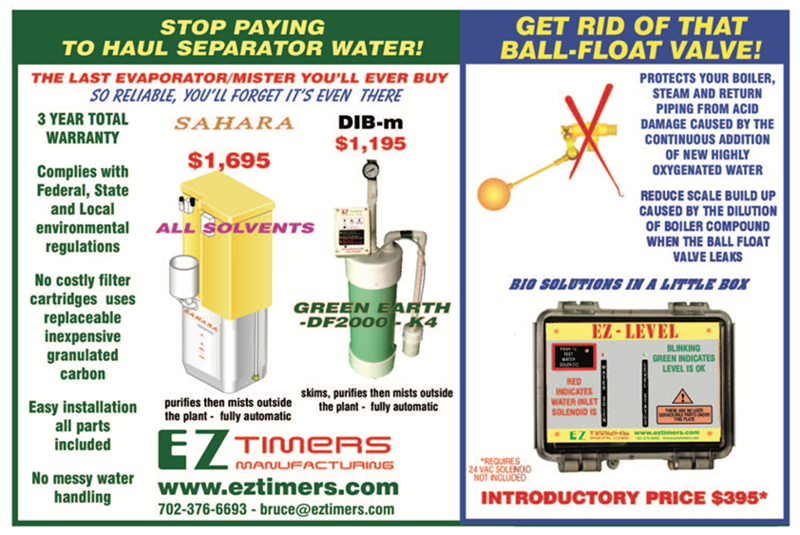 See our Ad in this issue and for further information on EZtimers products visit www.eztimers.com Please address any questions or comments for Bruce to bruce@eztimers.com or call 702-376-6693. © 2017 by BRUCE GROSSMAN all rights reserved under International and Pan American copyright conventions.